While googling Bill Granger's name in preparation for my post on his delectable corn fritters, I came across a restaurant review that Johnny Apple wrote when he visited Bill's cafe in Sydney. Not only did I discover that Bill apparently hates the way the first letter of his name, capitalized, looks and therefore insists on spelling it only lower-case (which, for some reason, I'm having a hard time imitating since apparently I take far grammar rules Far Too Seriously), but Johnny also included a recipe for B bill's coconut bread that is so popular he cannot take it off the menu. I hardly needed encouragement to clip that recipe, well, right that very minute. And what a recipe it is! It's so good, I'm wondering just how much else I've been missing by not owning a copy of one of B (dammit!) bill's cookbooks. Tell me, dear readers, what else am I missing? Not only does this coconut bread emerge toasty and golden and delicious from the oven, but it's resilient and versatile (toasted for breakfast? Check. Eating as is for mid-afternoon snack? Check. Sliced and covered with some sort of fruit salad or perhaps a glug of homemade chocolate sauce for dessert? Check.). I had to use cake flour instead of all-purpose, and unsweetened shredded coconut instead of that gluey Angel brand kind because it's what I had at home, and regular sugar instead of superfine - and still this bread turned out fantastically. Warmly spiced with cinnamon, agreeably textured from the small coconut flakes, moist and not too sweet - I think (dare I say it?) that this is my new favorite sweet bread. 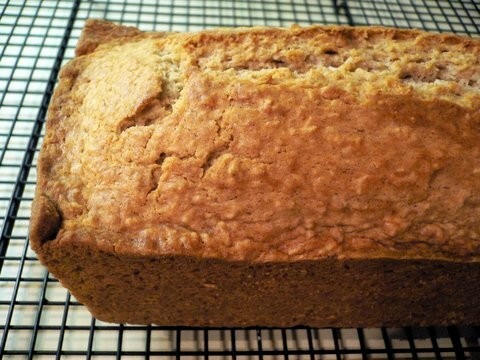 Move over, banana bread! There's a new kid in town. 2. In a medium bowl, sift together 2 1/2 cups flour, baking powder and cinnamon. Add sugar and coconut, and stir to mix. Make a well in the center, and pour in egg mixture. Gradually mix with dry ingredients, until just combined. Add melted butter, and stir until smooth. Do not overmix. 3. Oil and flour an 8 1/2-by-4-inch loaf pan. Pour batter into pan. Bake until a toothpick inserted into center comes out clean, 1 to 1 1/4 hours. Cool in pan 5 minutes, remove bread from pan, and finish cooling on a rack. 4. To serve, cut into 8 to 10 thick slices. If desired, toast lightly, spread with butter, and dust lightly with confectioners' sugar.